Joseph F. Healey has pointed out that White ethnic identities are evolving into new shapes and forms, merging the various “hyphenated” ethnic identities into a single, generalized “European American” identity based on race and a common history of immigration and assimilation. In light of the fact that virtually every minority group has generated a protest movement — Black Power, Red Power, Chicanismo — proclaiming a recommitment to its own heritage and to the authenticity of its own culture, European Americans should seize the opportunity to reclaim their ethnic and historical heritage on festive October occasions such as Columbus Day (Oct. 12) and Leif Erikson Day (Oct. 9). I sailed in the year 1477, in the month of February, a hundred leagues beyond the island of Tile [Thule, i.e. Iceland], whose northern part is in latitude 73 degrees north and not 63 degrees as some would have it … the season when I was there the sea was not frozen. In all societies with a history of migrations, the question “who came first?” becomes important. Centuries before Columbus and the Waldseemüller world map known as “America’s baptismal certificate,” the Icelandic sagas answered this question by immortalizing the names and deeds of the pioneers for posterity. Kirsten A. Seager has emphasized the “tremendous energy and momentum” indicated by the fact that the comparatively rapid colonization of Iceland and Greenland took place while the Norse were also tightening their grip on the British Isles. Indeed, the discovery of new lands in the West by the Northmen came about in the course of the great Scandinavian exodus of the 9th, 10th and 11th centuries when Vikings “swarmed over all Europe,” ruling the high seas, conquering kingdoms, founding colonies and empires. In these centuries waterborne Vikings exploded out of their native lands to trade, raid, and settle all the way “from the Pillars of Hercules to the Ural Mountains.” The main stream of Norsemen took a westerly course, striking Great Britain, Ireland and the Western Isles, ultimately to reach Iceland (in 874 A. D.), Greenland (in 985) and North America (in 1000 AD). His skills and qualities proved useful when he decided to explore the land to the west (Greenland), across some of the world’s most dangerous seas. The Greenland settlers encountered no other inhabitants, though they explored to the northwest, discovering Disko Island. (A small, but incontestable piece of evidence for the Norse Greenlanders’ High Arctic voyages is a small rune stone found in connection with three cairns on the island of Kingittorssuaq, directly opposite the entrance to Lancaster Sound — the eastern end of the Northwest Passage). Of the 25 open, square-rigged ships that sailed from Iceland, only 14 ships and 350 colonists are believed to have survived to reach their destination — an area in Greenland later known as Eystribygd (Eastern Settlement). By the year 1000 there were an estimated 1,000 Scandinavian settlers in the colony, but an epidemic in 1002 considerably reduced the population. 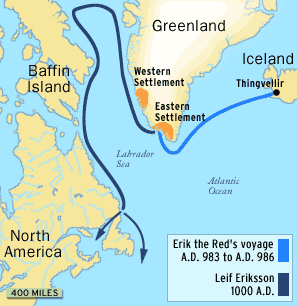 Twelfth- and thirteenth-century Icelandic sagas report — based on oral traditions and genealogies whose kernel of historicity were preserved for many generations — that Erik the Red gave the island its name — Greenland — as a marketing strategy designed to disguise its harsh environment and make it attractive to would-be colonists. Accustomed to hard, physical work and experts at exploiting the natural resources in the Far North, the pioneers were remarkably successful throughout the five centuries that passed “before smoke no longer rose above the turf-covered roofs of their settlements.” The settlement died out for unknown reasons (suggestions include “genetic deterioration, malnutrition, incompetent resource exploitation, fatal skirmishes with encroaching Inuit, failure to learn from the Inuit, pestilence brought from Europe, pirates descending from Europe, isolation from Europe, the breakdown of an already fragile social order, an eastward return to Iceland and Norway and last, but certainly not least, climate change” [Seaver 2010, 8–9]). The two Vínland sagas represent the subsequent events somewhat differently, but both sagas make it clear that Erik the Red and his family provided the initiative as well as the leadership for all of the early expeditions. 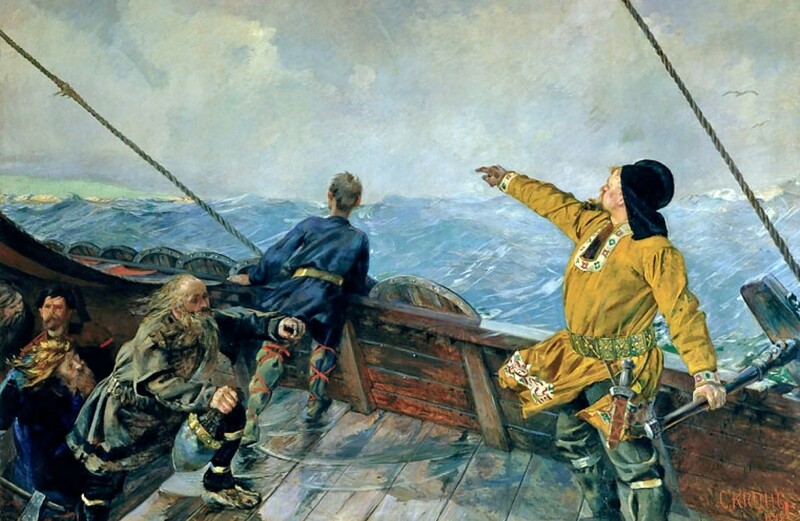 The captains on the voyages commemorated by the Vínland sagas were his sons or other members of his immediate circle, such as the visiting Icelandic merchant Thorfinn Karlsefni Thordsson (who was married to Gudrid, the widow of Leif’s brother Thorstein). Leif was the first to launch an expedition, followed by expeditions headed by his brothers Thorvald and Thorstein, one led by his sister Freydis, and one by Karlsefni. Christian Krogh (1893): "Leif Erikson sights land in America"
The second of three sons of Erik the Red, Leif “the Lucky” Erikson (d. 1025) sailed from Greenland to Norway in the year 999 AD, where he was converted to Christianity by the Norwegian king Olaf Tryggvason. 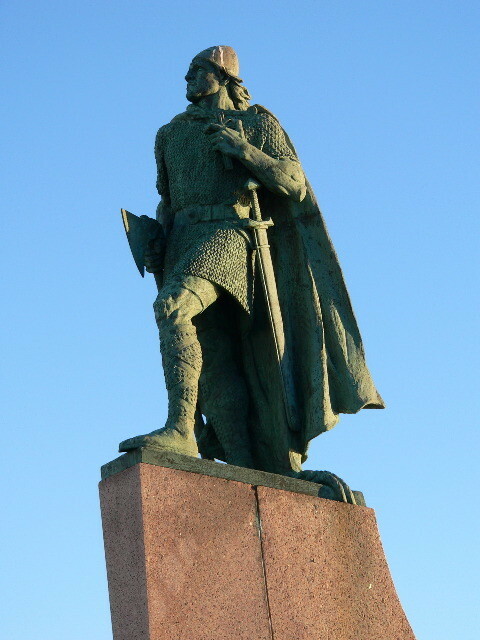 Leif “the Lucky” joined the king’s body-guard, but was shortly afterwards commissioned by Olaf to urge Christianity upon the Greenland settlers. On returning to Greenland, he proselytized for Christianity and converted his mother, who built the first Christian church in Greenland (her husband, Erik the Red, remained true to the ancient Germanic gods). The Norse — as did the Continental Franks, according to Ricardo Duchesne (2011, 370) — continued to fight in the berserker style (frenzied intensity, with no concern for personal survival), unhindered by a version of Christendom that gave Christ qualities of the Germanic war god Odin/Woden. Speidel (2004, 33) observes that “northern and southern Germanic lands shared warrior styles and heroic myths.” By 1053 — despite the polytheistic preferences of the Norse — the Christian church was well enough established to warrant inclusion in the Archbishopric of Hamburg—Bremen since Pope Leo IX includes it in a bull dated 6 January 1053, the earliest known reference to Greenland by name. 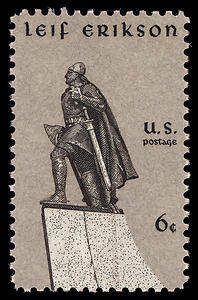 Leif Erikson first learned of Vinland from the Icelander Bjarni Herjulfsson — “a man of great promise,” according to the Saga of the Greenlanders. Fourteen years earlier he had become the first European to sight mainland America when his Greenland-bound ship was blown westward off course. He apparently sailed along the Atlantic coastline of eastern Canada but did not go ashore. In the year 1000 AD a crew of 35 men led by Leif Eriksson set out to find the land sighted by Bjarni. The sagas refer to three territories: Helluland (“Flat-Stone Land,” probably Baffin Island), Markland (“Forest Land,” probably Labrador) and Vinland (“Wine Land”) — usually thought to have been located in the area around the Gulf of St Lawrence, possibly New England or New Brunswick. The Norse enthusiastically filled their ships with grapes and cut vines and timber besides. By the time they left for Greenland the following spring, they had an excellent cargo and were so pleased with their venture that Leif “named the country after its natural qualities and called it Vínland” (Seaver 2010, 53). Thorfinn Karlsefni also reported that he found “wine berries” growing there, and these were later interpreted to mean grapes. Seaver (2010, 50ff) emphasizes that, given the fact that the Norse had been trading with and on the European continent for several centuries when they set out to explore North America, they knew very well the ingredient required for making wine. Vinland cannot be equated with the grapeless Newfoundland, whose Viking site seems to have functioned as a trans-shipment station for American goods intended for Greenland-based trade. The houses at L’Anse aux Meadows at the northernmost tip of Newfoundland are now widely believed to represent Leif Erikson’s “strategically selected wintering camp, used and expanded for a while by subsequent skippers and crews, much as implied by the sagas” (ibid). Another prominent woman in the Saga of Erik the Red, Thorfinn Karlsefni’s wife Gudrid (the widow of Leif’s brother Thorstein) gave birth to a son, Snorri (born c. 1005) — the first European born in America. By the time they had stayed there three years, the colonists’ trade with the local Native Americans had turned into full-scale warfare, and so the colonists returned to Greenland. Despite the failure of their efforts to establish a permanent presence in North America, the Norse did make later visits to Vinland to secure materials, and stray finds have turned up in the excavation of native American sites, including a late eleventh-century Norwegian coin found on the central Maine coast (the coin was minted in Norway between 1065 and 1080 during the reign of King Olaf III). An Icelandic chronicle, Skálholtsannáll (1347), makes reference to a Greenland-ship that had been to Markland on a timber-gathering expedition. Timber for shipbuilding was crucial to the Norse, and both Iceland and Greenland were largely deforested. It has been suggested that the Icelandic colony — from which the Vinland explorers emerged — was “an interesting forerunner of the American republic, having a prosperous population living under a republican government, and maintaining an independent national spirit for nearly four centuries.” The western world’s first parliament — the Althing — was established in Iceland. It has convened every year without exception since the early 10th century. The Norse 10th-century colonization of Greenland, and their 11th-century voyages to North America, “mark the farthest reach of the medieval Norse quest for land and livelihood” (Seaver 2010, 1). This medieval expansion of European “Lebensraum,” establishing footholds in the New World, can also be seen in the Norman march eastward to create Western European states in the Mediterranean (Castile, Portugal, Cyprus, Jerusalem, Sicily), and in the settlement of German knights, Frankish and Dutch colonists in Eastern Europe that gathered momentum from the eleventh century onwards. In this period, the northern and western isles of Britain, northern Scotland, and the North Atlantic isles (the so-called insular Viking zone) became part of what Peter Heather has called “a Scandinavian commonwealth,” the lingua franca of which was, it has been suggested (at least in the Anglo-Saxon lands), an Anglo-Scandinavian dialect. 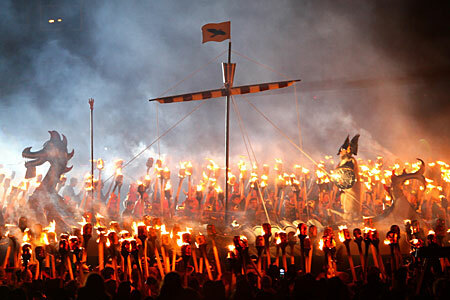 The Vikings are still commemorated by annual festivals such as Up Helly Aa, held on the last Tuesday in January, in the depths of winter darkness in the Far North. The day begins with the year’s elected Jarl (earl or leader), and his fifty-seven-strong retinue of guizers marching through the streets of Lerwick dressed in scarlet velvet, wearing winged helmets and carrying elaborate shields and heavy war axes. 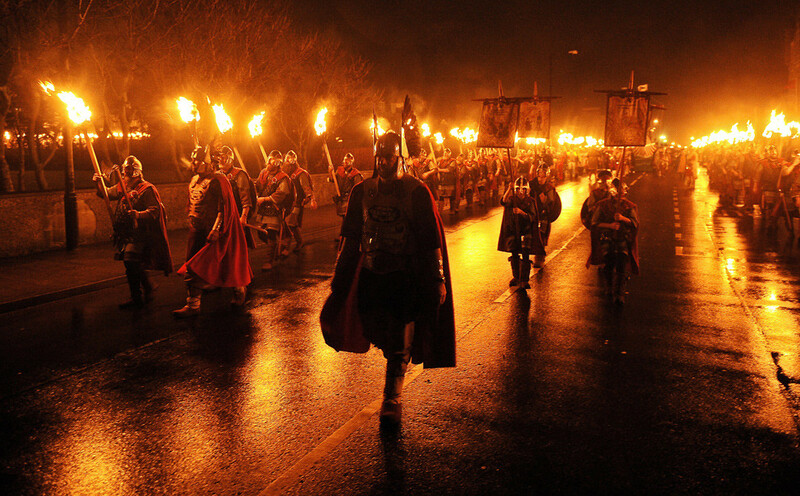 Becoming the Jarl of Up Helly Aa is a great honor. The Jarl assumes the name Sigurd Hlodvisson for the day and receives the freedom of Lerwick for the duration of his twenty-four-hour reign. 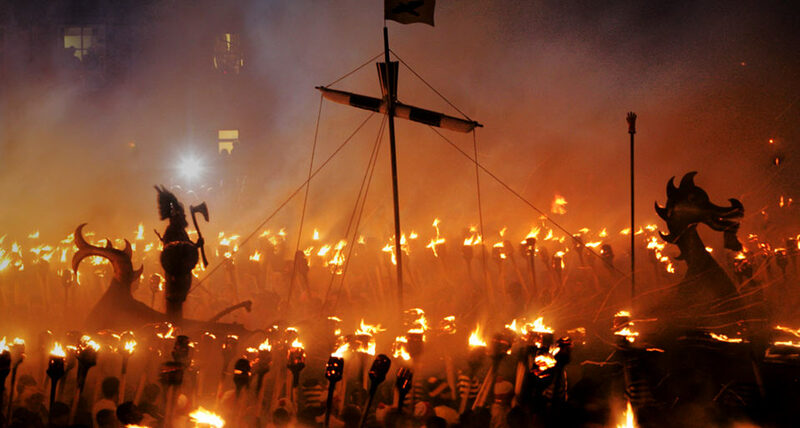 The culmination of Up Helly Aa is the ceremonial torching of Sigurd’s galley Asmundervag, specially made for the occasion. The real Sigurd Hlodvisson, also known as Sigurd the Stout, lived from 980 to 1014. Sigurd was the Norse Earl of Orkney and divided his time between visiting his overseas dominions, in Ireland and the Isle of Man, and summers spent raiding the Hebrides and the Scottish mainland. 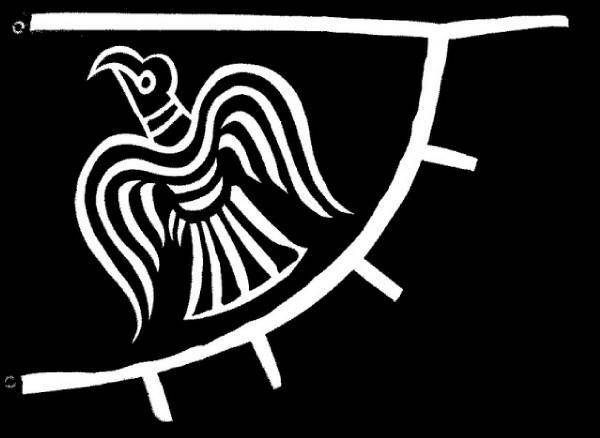 During these raids, the magic raven banner of Odin, belonging to Sigurd’s grandfather Einar (the son of Earl Ragnvald of More, Norway), might have been seen blowing in the wind, depicting a raven in full flight. The raven was the symbol of Odin, and its magic ensured the victory of the army before which it was displayed. Would that Europeans and their descendants in the New World — inspired by their Norse ancestors — could reclaim their courageous ways and pioneer spirit.